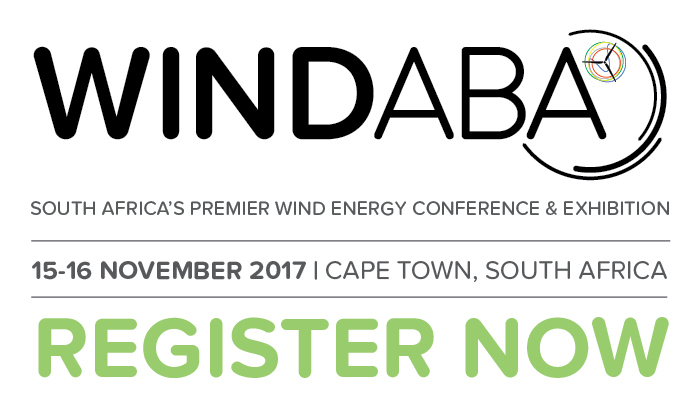 The 7th Annual Windaba Conference and Exhibition will take place from 15-16 November 2017 at the Cape Town International Convention Centre (CTICC), South Africa. A flagship SA Wind Energy Association (SAWEA) event, Windaba has established itself as Africa’s leading wind energy conference bringing together some 600 international and domestic decision makers and stakeholders that are active in the contemporary wind industry. This ‘must-attend’ event provides a solution-focused platform for consideration of the challenges and opportunities for the established Wind power market. This year, under the theme, ‘Wind Power: Building Futures’ SAWEA in proud partnership with the Global Wind Energy Council (GWEC) will host its most dynamic conference yet. The current status of the RSA RE market and Wind power within this: what has been achieved? What are winning project models? What are future policy-aligned MW potentials? What are the key zones for job creation? How can the value chain be expanded? The policies needed to underpin market growth: What is planned? What has been learned? What changes are required e.g. to REIPPPP rules for future rounds? Local socio-economic and economic benefits. Transformation of the sector: employment, procurement, youth &women,achieving economic development objectives and ownership. Local manufacturing and local content. Beyond the REIPPPP: power sector reform, legal and policy changes, private off-take opportunities within the current legal frameworks. Finance considerations for a future SA market & much more. Showcasing business is a key draw card to participating at Windaba. Our floorplan maximizes exposure for any business scale and type. Contact our team via the website: www.windaba.com to secure your opportunity to tailor your exhibition options to best achieve your strategic business objectives.